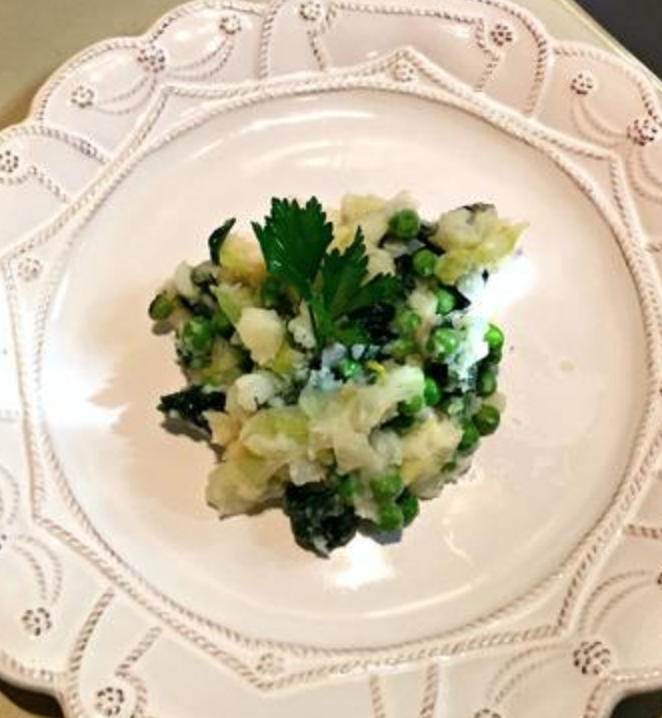 Colcannon is a traditional and hearty Irish vegetable casserole with potatoes, kale, peas and cabbage. Make your St. Patrick’s Day (or any occasion) greener and celebrate with this creamy, festive dish! Adult roughly chop the potatoes and parsnips. Child Carefully place potatoes and parsnips in a big pot of water to boil. Cook over high heat until tender, about 30 minutes. Adult Meanwhile, remove the core from the cabbage, slice thinly and put into a large saucepan. Chop the kale into small pieces or strips. Child Add chopped kale to the cabbage and cover with water to cook for a few minutes until cabbage is just wilted. Adult & Child Drain thoroughly before returning it to the pan. Caution: can be hot. Adult Chop the onion and mince the garlic. Child Add to saucepan with the cabbage and greens. Add the peas. Adult Drain the potatoes and parsnips and transfer to a large mixing bowl. Caution: very hot. Adult & Child Mash thoroughly to remove lumps and add butter. Gradually add milk and mix. Season to taste with salt and pepper. Child Add the cooked greens mixture slowly.